The Bowater Toyota environmental champions responsible for the Eco Fund. Sandie Horne, Chris Westley & Tony Bowater. Click photo to enlarge. 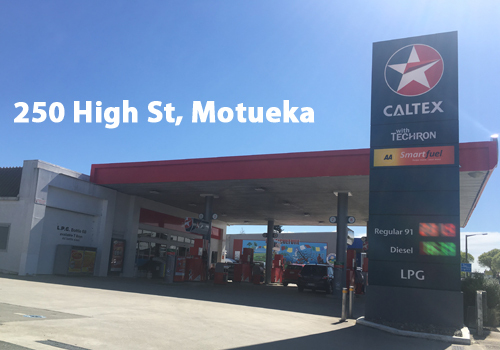 Bowater Toyota are in a wonderful position of being able to support local, environmentally based community groups to do their much needed work. 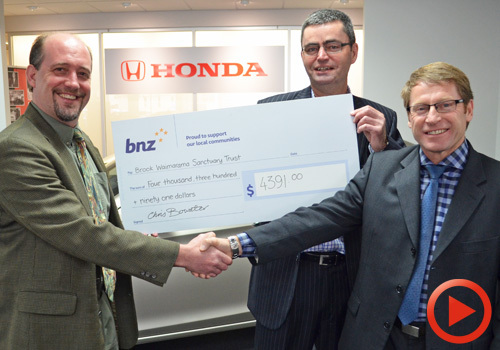 Every year the team of environmental champions at Bowater Toyota have the pleasure of finding and presenting often much needed funds to these groups, or group depending on the end result of the selection process. All of the branches of Bowater Toyota have got Vehicle Battery Recycling Stations set up in the reception area of the service departments. 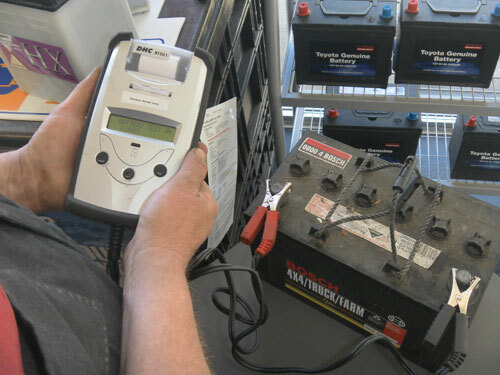 We encourage all of our customers to drop off any old, unused or damaged vehicle batteries to us and we will arrange for them to be recycled. We accept any kind of vehicle battery, car, motorcycle or truck - they can all be saved from poisoning the local environment by being sent for recycling. Every time we do this the recycling company pay us for the batteries as they collect them from us, and 100% of the money goes into a separate Bowater Toyota ECO FUND, which we then distribute to local environmentally focused charities. 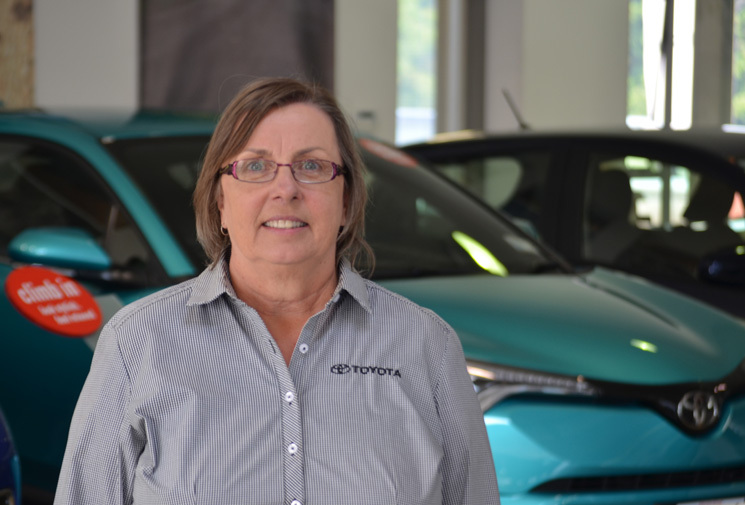 If you want to learn more about the process of battery recycling click here to go to the Bowater Toyota environmental section. 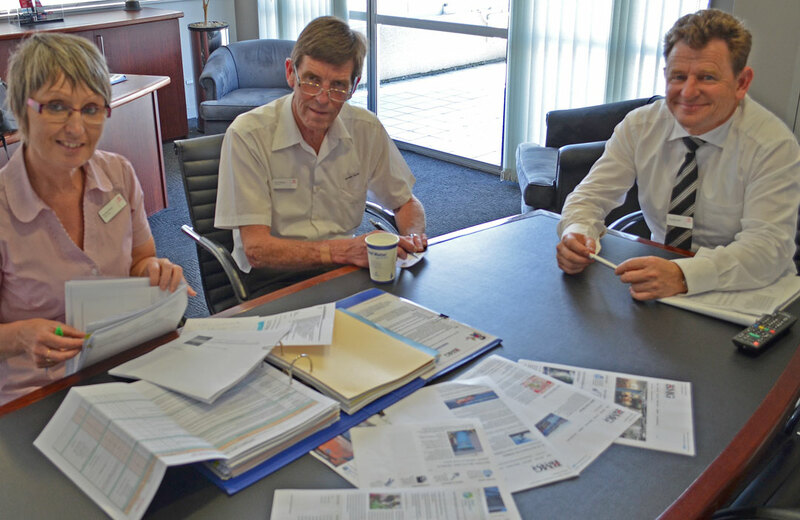 When it comes to environmental causes across the board the Bowater Motor Group are keen supporters. We are also very focused on the impact our collective businesses make and have approved environmental policies in place to make sure we actively manage any and all risk factors. Follow our journey in this section of the website as we shine a light on some of these organisations that work hard in various aspects of the community. Take the time to learn about what these groups do, how you can be involved, and how you can help us help them. Please support our iniatives by dropping off your batteries to us. Tony Bowater (right) presenting the $2000 Bowater Toyota EcoFund Cheque to Don McLean (far left - Hampden St School) and Karen Driver (far right - NEC). Click to enlarge. 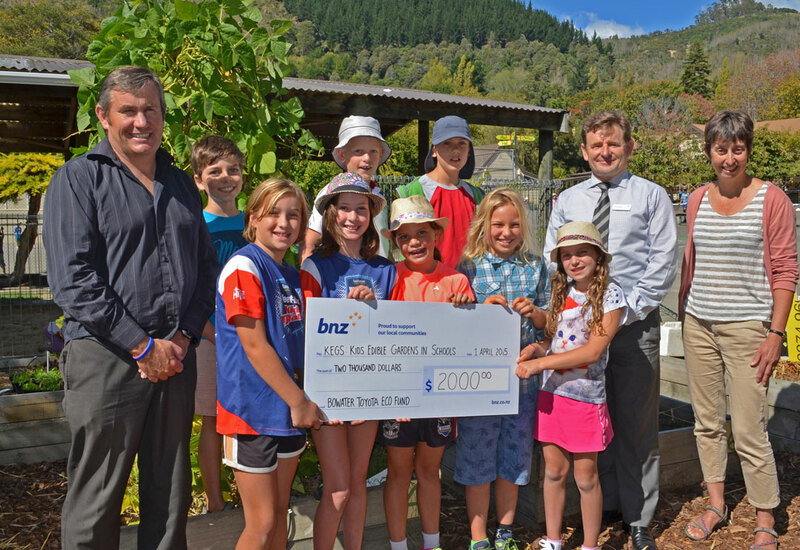 Tony Bowater was very excited to be able to present a $2000 cheque to Nelson Environment Centre from this years round of funding from the Bowater Toyota EcoFund. The venue for this cheque presentation was chosen to be Hampden Street School, one of the schools involved in the K.E.G.S (Kids Edible gardens in Schools) programme. Hampden Street school has been very passionate about the K.E.G.S programme, with a large group of students very engaged with the programme. After presenting the cheque to Karen Driver (via the kids) we spent some time chatting to the students about the impact such a programme has had on their everyday lives. Many now had vege gardens at home, encouraging their parents to get involved and create a fun family activity that also produced produce! 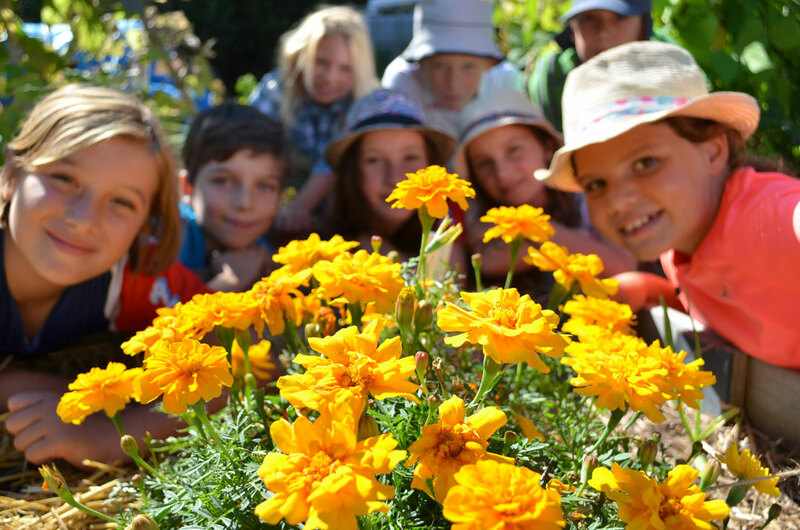 This years winners of the Bowater Toyota EcoFund are setting up our kids for the future by creating edible gardens in schools. Click to enlarge. Sometimes thinking too much about the world we live in can be a little depressing, or extremely motivating if you are wired in more of a positive mode. We are living in times of great change. Times where we see skills of old slowly fade away as we edge ever closer to the model of a disposable society as pressures on time and family compound and it becomes easier to make the lazy, quick choice for the sake of reducing stress. A world where eating all of the wrong things is an increasingly easy choice to make, and a world where childhood obesity is on the rise. Our diets are suffering, but most dramatically, the health of our future generations is suffering through an increase in screen time of our kids and a dramatic decrease in outside time. A time where there is an ever increasing disconnect between the food we eat and the effect it has on our bodies. 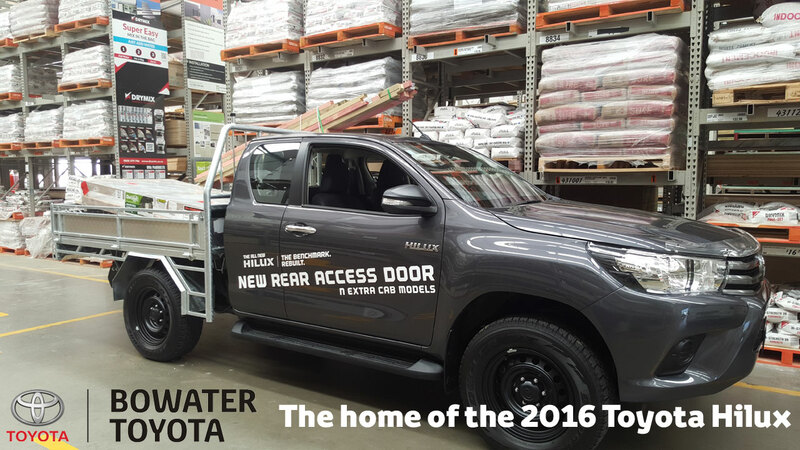 This years Bowater Toyota EcoFund winners are setting about bringing positive change into this equation. They are all about empowerment. They are a breath of fresh air and a bunch of people looking to effect great change from the grassroots up - quite literally! There is a beautiful saying that is never more true in our busy lives today. Give a man a fish and feed him for a day, teach a man to fish and feed him for a lifetime. The same can also be said for gardening. In some regards even more so as it is a skill that runs through so many elements of one's life. The skills of nurturing, care and follow through. The creation of a sense of awareness and interconnectedness that children especially seem to respond instantly to. These were once vital skills that every family handed down in some way or another as almost every family had a vegetable garden that produced at least a portion of their food, and created resources for preserves and other homemade delicacies. This year the team at the Bowater Toyota EcoFund were especially pleased to be able to present a donation of $2000 to the NEC KEGS Programme. 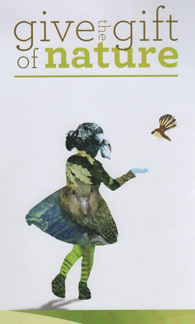 The NEC (Nelson Environment Centre) is a charitable, not for profit, incorporated society that first started back in 1976 and is now the longest serving environment centre in New Zealand. Have you had your cupcake today? Meet Ursula, a crafty administrator. 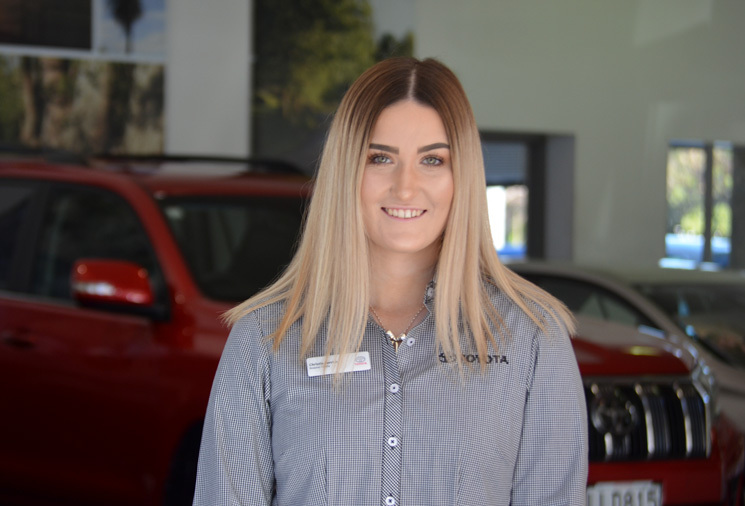 Ursula Inwood joined Bowater Toyota in 2018, and is occassionally one of the friendly faces in the main reception for the store. Her main role is in the accounts department working hard to keep everything in order. In her spare time she dabbles in craftwork, and is quite the accomplished in many different crafty disciplines. Taking versatility the extra mile. 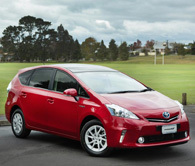 All new Prius V brings together class-leading versatility and hybrid technology to create the newest 7 seater hybrid available in New Zealand. V is for versatility, and also for very spacious, very practical, and very environmentally friendly with a fuel consumption of just 4.1L/100kms.